I tried to only bother Him with the big things. 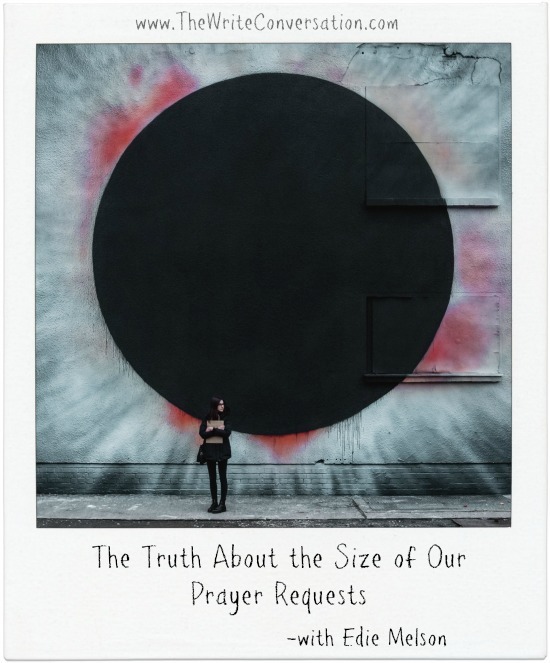 When I shared my prayer requests with others, I was careful not to bring up requests that I’d decided were minor. I knew that nothing was too big for God, and I’d even share that thought with others who were struggling. And while this is an absolute truth, it leaves out so much. Then one day I had an epiphany. With God, no matter how big the request, it’s still small to Him. That bit of revelation took me a few days to process. But as the truth of it permeated, so did the freedom that came with it. My attempt to differentiate between big and small, hard and easy, was artificial. It was a barrier that I had invented and erected between us. Since everything is small to Him, there really is nothing that I can’t share with Him. The truth is that God cares about everything that I care about. I am His child, precious to Him. So I’ve given up categorizing my requests and worries, and I’m just taking everything to Him. A wonderful and timely reminder, Edie! The "everything" resonated with me. I tend to bring matters of spiritual things and people to Him, but not things that were important to me but didn't pertain to ministry. I won't do that anymore. Thank you, Edie. Sometimes the 'small' answers impact me more because it shows His extreme awareness of everything about my life. Good lesson, good reminder! Thanks. Amen Ms. Edie! My belief is that the size of the prayer is directly related to the faith in which we pray with. If we pray with urgency, zeal, and the truth of God's word behind our prayers, I believe God listens more intently. All requests are important, but how I pray is more important to me than what I pray. Hope that makes sense. Sometimes even writers struggle to find the right words. I know these are right... My prayers for God's blessings upon you and your family sweet lady. it's what God does, not what we try and do. I feel bad bringing trivial or small concerns to God. Your post changed my perspective. Thank you. A beautiful reminder how God sees our needs. He's concerned about ALL our issues and tells us to give them to Him. Amen, sister! Thank you for reminding us of that significant truth. I retweeted. I just found this via Christian Writer/ Reader Connection. I really don't know how I missed it. This reminder is so refreshing. Thank you, Edie for sharing your thoughts.